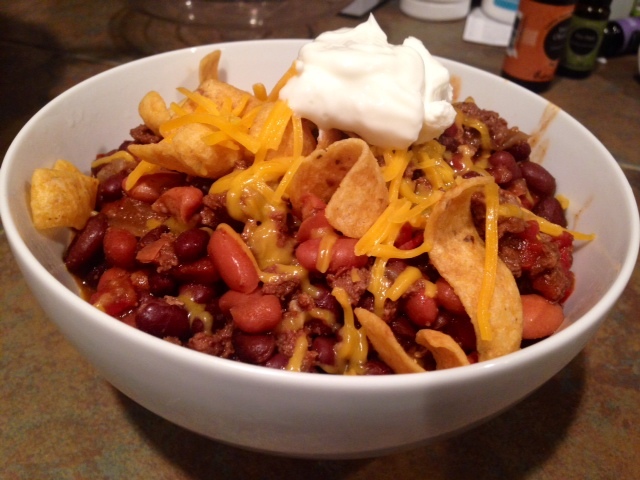 Let’s be honest, chili is just an excuse to eat corn chips. 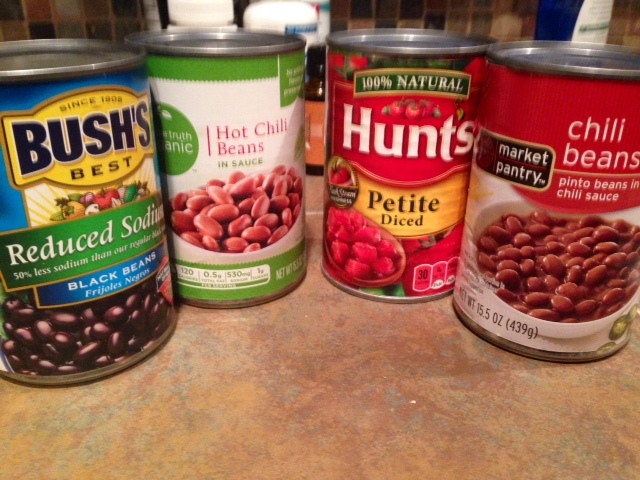 When the weather is cold, I always start getting the urge to make chili. Here’s the thing I realized this year, though. 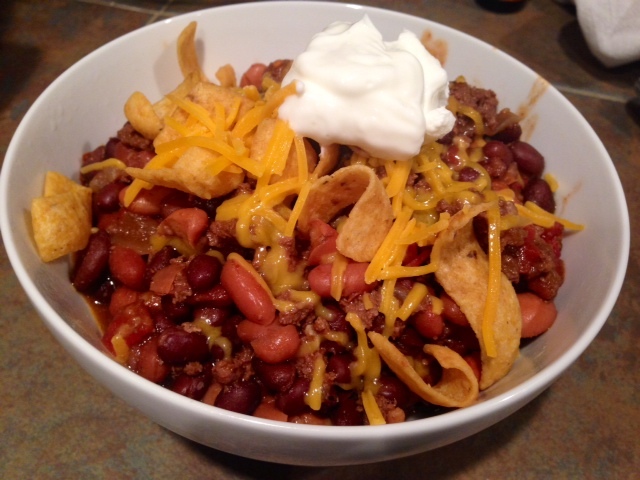 I’m much more into the *idea* of chili than in chili as its own thing. I end up making a huge batch and then have gobs of chili leftovers, which I have to eat for a solid week to get through (yes, I realize I could freeze it, but I don’t like the texture when it’s thawed). So once I year I make a big pot, a tradition I can’t seem to break. My recipe isn’t anything earth-shattering, but it’s delicious and mellow and hearty and comforting. Heat a skillet (I prefer cast iron) on medium with a tablespoon or two of oil. Dice the onion, and add to the pan. 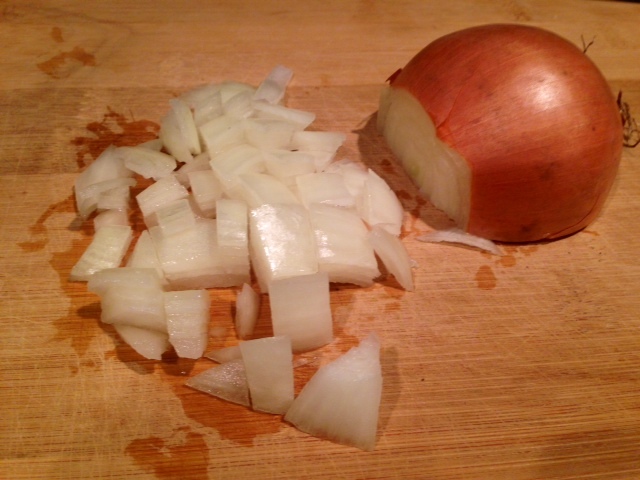 Cook for 4-5 minutes, until the onions are soft and translucent. Add the thawed meat to the pan. Typically I cook meat from frozen, but since the onions are in here, I recommend thawing it for a couple minutes in the microwave or overnight in the fridge. Cook until the meat is fully browned, stirring and chopping it up as you go. Once it’s mostly bronw, you can add some salt, pepper, and garlic powder. 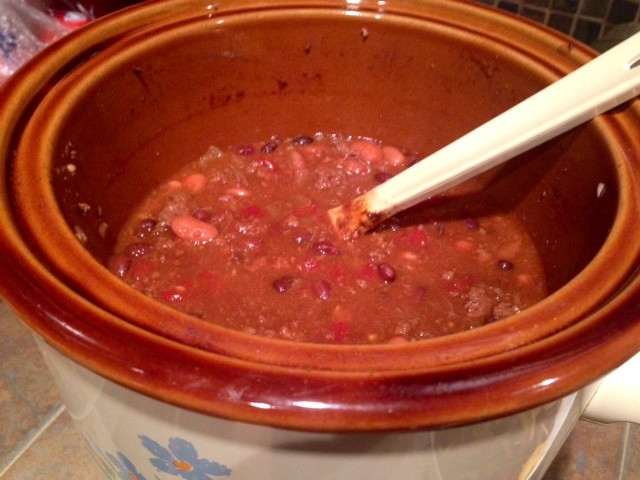 Turn your crockpot on high and add all the beans and the petite-diced tomatoes. I recommend draining and rinsing your black beans so you don’t add all that grainy black liquid. I’m lazy and don’t totally rinse them, but do drain the black liquid out of the can and then pour some water in and drain a couple more times. Add the cooked meat and onions, as well as the chili powder, molasses, and a little more salt and pepper. Stir everything together. Cook on high for a couple hours, then switch down to low. If you’re pressed for time, you can serve after it cooks for a couple hours, but obviously the flavors get even better the longer they simmer. Serve piping hot on a bed of corn chips, sprinkled with melty cheese and some cold sour cream. Now *that’s* a winter meal. Dice the onion, then heat a skillet (cast iron preferable) on medium, and add the onion with a tablespoon or two of oil. Cook for 4-5 minutes, until the onions are soft and translucent. 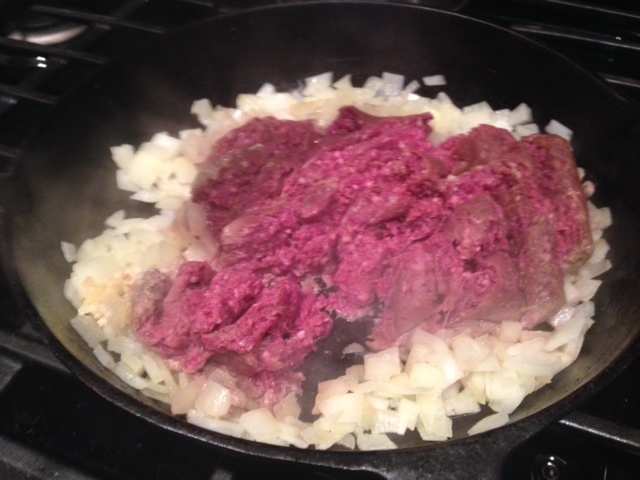 Add the thawed meat to the pan (recommend thawing in the microwave or in the fridge if possible). Cook until the meat is fully browned, chopping it up as you go. You can add some salt, pepper, and garlic powder too, if you’d like. 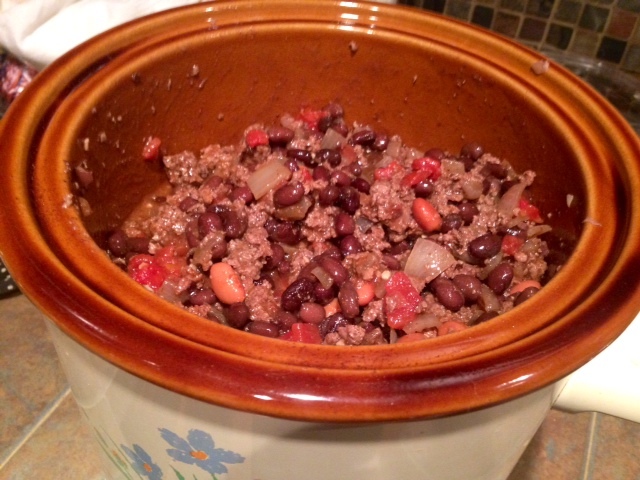 Turn your crockpot on high and add all the beans and the petite-diced tomatoes. I recommend draining and rinsing your black beans (I’m lazy and don’t totally rinse them, but do drain the black liquid out of the can and then pour some water in and drain a couple times). Add the cooked meat and onions, as well as the chili powder, molasses, and a little more salt and pepper. Cook on high for a few hours, then switch to low. Serve with corn chips, shredded cheese, and sour cream or greek yogurt. Keeps in the fridge for about a week.